This is a beautiful 42" round glass table top -- place on stand to create an instant large table or use as protective table cover on top of your existing round furniture. This circular glass table top can also be used in situations where the entire surface is made out of glass. The glass table top compliments any base made of glass, wood, metal or any other material. To increase the strength of the glass, tempered options are available. 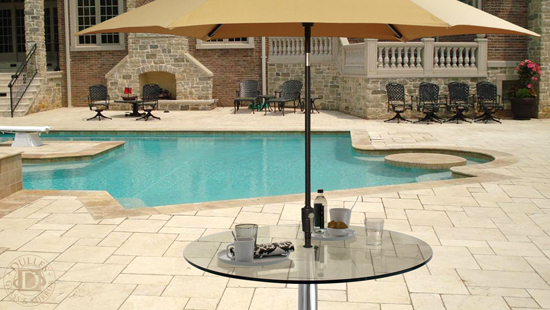 The Patio Table Top with Center Hole comes with a 2" umbrella hole, pre-drilled and seamed. Perfect for outdoor use. The edges of the glass are flat polished to provide a smooth finish. 1/4" Glass Thickness is normally used when you want to add a protective glass surface to an existing table. 3/8" Glass Thickness is normally used to cover an existing surface such as wood, metal, etc. Or it can be placed on a pedestal to create an instant table. 1/2" Glass Thickness is normally used on a pedestal table where the extra thickness will add stability. Tempered glass is a type of safety glass regularly used in applications in which standard glass could pose a potential danger. Tempered glass is four to five times stronger than standard glass and does not break into sharp large pieces when it breaks. Tempered glass is manufactured through a process of extreme heating and rapid cooling, making it harder than normal glass. 1" Beveled Polish: In this application the edges of the glass are cut and polished in an angle with 1" bevel width for a beautiful finish. This process leaves the glass thinner around the edges and thicker in the center. This is normally used in places where the glass is a focal point in the room. Flat Polish Edge: In this application the edges of the glass have been polished to a smooth shiny finish. Choose a flat polish when the edges of your glass are visible and you prefer a minimalistic look. Pencil Polished: In this application the edges of the glass are cut and polished to a slight curve for a smooth, traditional finish. 42" 42" 42" 42" 42" 42"
1/4" 1/2" 3/8" 1/2" 3/8" 1/4"